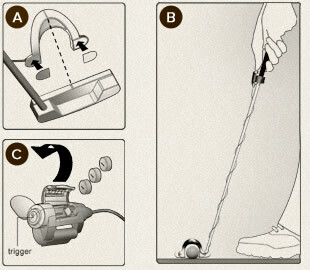 a Attach adhesive strips onto the back of the laser unit legs, line up the groove on the top of the unit with the center groove of your putter, then attach both together. 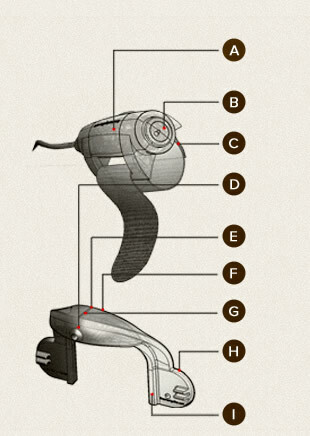 b For best results, coil the trigger unit wire around the putter shaft before attaching the trigger unit. Velcro strap ensures adjustable fit. Wrap around the putter shaft, then fasten. Always aim away from eyes, never stare into the laser beam. use three LR44 size batteries with the negative (-) facing the trigger.